From discovering the basics of pony care to bonding with new found friends, camp is an experience that children never forget. Our ranch offers a multitude of stalls, horses, tack and arenas ,presenting the full “cowboy” experience to children six through sixteen. Daily camp activities focus around the horses, learning how to feed, lead, groom, bridle, saddle up and RIDE! These activities not only challenge your child's physical skills but also build self confidence and independence through personal achievement. Horses and equipment are provided by Diane's Riding Place. All campers MUST be at least seven (7) years old to participate. We also have a Ladies Horse Camp for those who want to ride, learn new patterns, brush up on their riding skills and just plain have fun. We are now taking reservations for the 2019 Spring Horse Day Camps and the 2019 Summer Horse Day Camps. These five-day riding camps take place Monday through Friday from 9:00 am to 12:00 noon or, during some weeks, 9:00 am to 2:00 pm (no regular hour option available during extended hour camps). Tuition is kept at a low $350 (PayPal $370) or $475 (PayPal $500) for extended camp hours, in order to provide an outstanding experience for children of all backgrounds. Please note: successful reservation requires the completed registration form (download below) AND payment. Please, call for camp availability before reserving. Note: successful reservation requires the completed registration form AND payment. Please, call for camp availability before reserving. Diane's Riding Place offers “stress free” celebrations for all ages. Imagine pony rides, games, prizes and a fully decorated “Posse Room” perfect for your memorable event. Unique parties are our specialty. Birthday extravaganza? No problem. 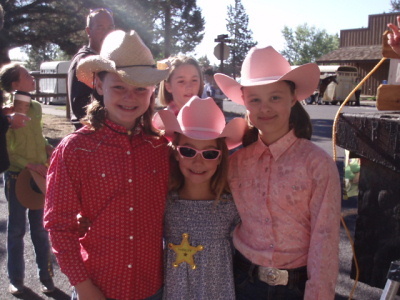 Moms love our hassle free parties and kids cherish their horse memories forever. Our parties are affordable, quick and easy for the busy families of today. Birthdays are what we do best but consider us for end of the year gatherings or family reunions as well. Birthday packages are offered below. Call for prices on other group opportunities. Copyright © bendhorseride.com. All rights reserved.